Star Trek Beyond is the third installment of the reboot Star Trek franchise. We find ourselves on the USS Enterprise with Captain James T. Kirk (Chris Pine) questioning what his 5-year voyage to discover the unknown truly means. He has become bored of the monotomous daily routine of being captain of the ship. We find Commander Spock (Zachary Quinto) also struggling between his commitment to the USS Enterprise and his commitment or guilt to his almost extinct Vulcan race. It doesn’t take long for the peaceful nature to come to an end when the crew receives a mission to help a group in distress. They accept the mission and soon find out that things are not what they truly seem. The crew is now tasked with finding a way to return home and also defeat the bad guy in the process. I truly enjoyed that this film had more witty moments than it predecessors. 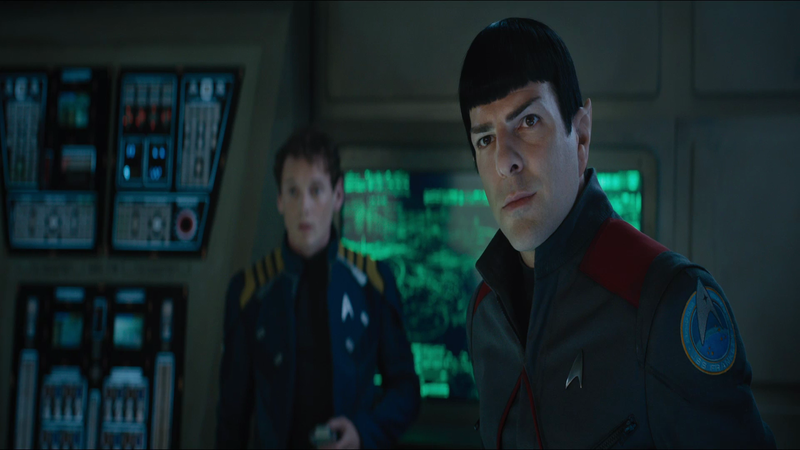 This was mainly due to the fun banter between Commander Spock and Doctor “Bones” McCoy (Karl Urban). I wanted to see more character development from the USS Enterprise crew, however, the only glimpse of what their private lives entailed came from a brief few seconds with Sulu’s (John Cho) family which was a last minute decision change of the movie. Chekov (the late Anton Yelchin) and Montgomery “Scottie” Scott (Simon Pegg) are just a blast to watch in their elements. Scottie finds a new friend in the movie called Jaylah (Sofia Boutella) who introduces a rough around the edges female character to the film. She is fun to watch on screen from her banter with Scottie and also her fierce combat skills. I had high hopes when it was announced Idris Elba would play the villain Krall. However, due to poor character development and a big reveal which came too late in the film the main villain was almost forgettable. Overall, Star Trek Beyond is a good movie but not great. You will leave feeling almost satisfied but still wanting just a little bit more. I would say this movie is quite different from the previous two films and would compare it more to the television series instead. If you are looking for a movie with good action scenes mixed with a hint of comedy and predictable villain plots this is for you. While I wasn’t wowed by the movie it is definitely worth a PAY to see in movie theaters. For all the Trekkie fans live long and prosper. Star Trek: Beyond opens everywhere 7/22. Purchase your tickets in advanced from Fandango and don’t get sold out! Have you seen Star Trek Beyond? Share your thoughts below!